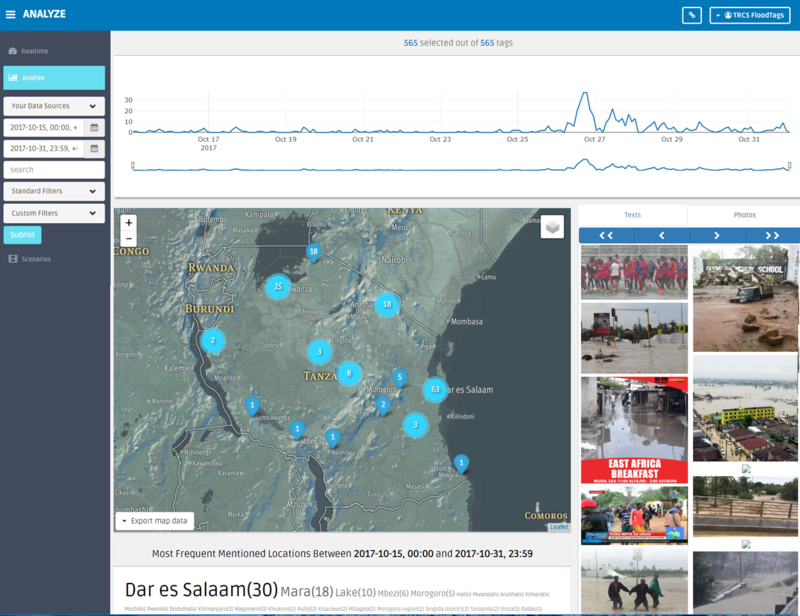 The Tanzanian Red Cross Society, Deltares and FloodTags analysed publicly available online media (including Twitter, Jamiiforums and various online news websites) for early action and flood response in Dar Es Salaam. With this the Red Cross can 1) map and monitor flood related events in real-time (sign-up and request access here) and 2) use historic event data for future impact forecasting. The results are integrated in a mobile website here. FloodTags is currently fully operational at the Tanzanian Red Cross. The first tool enables the Tanzania Red Cross Society (TRCS) to monitor and analyze flood information from a variety of online media sources. It uses flood related data from international sources such as Twitter, but also draws from local sources of data, being the flood information shared by Red Cross members and volunteers through WhatsApp and the Tanzanian social medium JamiiForums. The system monitors and analyzes the data, and distributes the analysis results through an online dashboard (see below figure). Use that data as impact information for fund requests to donors, like the disaster relief emergency fund (DREF). While the first tool provides the TRCS information about what is going on in real-time, the second tool is aimed at providing forecasts on the basis of historical infomation. Therefore we analysed 140.000 online news articles and detected 175 individual flood events in Tanzania over the past 10 years. By analysing those historic flood and water scarcity data together with data about hydrologic variables such as precipitation and discharge, relations between the two were established and hydrologic variables can be directly translated to expected impact. This now enables the TRCS to forecast the expected impact of a flood event, based on the severe weather alerts they receive from the Tanzania Meteorological Agency (TMA): In the online tool, the user fills in the province of interest, the current condition of the area, and the forecast amount of rainfall. The tool will then search for similar situations in the past, and calculate the expected impact from news articles about this past situation. This provides impact estimates to the user, such as the number of casualties of an event or people evacuated. Additionally, users of the tool can follow the links to the news articles, to get an in-depth overview of the past event.